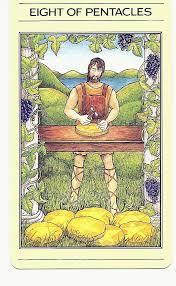 Apple River Tarot Readings - It's Not The Destination, It's The Journey: Eight of Pentacles - Deal or No Deal? The Eight of Pentacles can be seen as an ongoing theme of accepting change in our daily lives, whatever hand we are dealt, urging us to let go and remain hopeful. We see Persephone headed down the stairs to the underworld in pursuit of Aphrodite's beauty cream! She's very aware of the likelihood, that she'll not be returning. She's let go and resigned herself to this and accepted this reality, but all is far from lost. When it comes to loosing hope, there's really no deal. In desperation we might be thinking we can some how guarantee a future reconciliation, but this isn't relinquishing control. Coming to the realization that we can't bully, plead, or make with deal with the divine or some how blackmail our way into a solution, is a useless exercise. When we're at this point on our lives , now's the time to take advantage of the opportunity to educate ourselves, and learn the lessons to be found in letting go. We may feel that we've lost everything, but there is much to be gained. The truth of the situation must be faced. There's nothing else left to do, and there's no way to go, except to let go. This letting go often is accompanied with depression, sadness and morning. If we can proactively engage in the same kind of positive change and transformation we find in the Death card, we'll find a tangible and real hope that we can apply to our lives in a real way. Letting go will change us by submitting to that which is greater, the will of the divine, the great Goddess of Love which is imaged in the Eight of Pentacles.